When the Bush regime filled the off-shore prison at Guantanamo Bay with men seized from around the globe, we did not know that torture was being used and that most were turned over for bounty. Now we know. When Barack Obama was elected, he promised to close Guantanamo within a year…five years ago. But the torture camp at Guantanamo is still open, with new infrastructure and more personnel than ever. As Shaker Aamer, the last British resident held at Guantanamo, describes their daily humiliations, “National security rides roughshod over human rights.” When the prisoners – perhaps the most powerless people in the world – put their lives on the line in a hunger strike for justice – how can we turn our backs and say “There’s nothing we can do”? This Friday and Saturday, there is much that you can do! Momentum is building for powerful events this Friday and Saturday. On Thursday from 1:30 pm to 3 pm on Q4 Radio AM 1710 community radio, broadcasting in Wicker Park and Humboldt Park, two members of our Coalition will discuss Guantanamo, what it means, and what we can do (you can listen from anywhere at www.que4.org), and Mario Venegas will be a guest on Gay Liberation Network’s call-in program on CAN-TV cable channel 21 in Chicago on Friday evening at 6:30 PM. 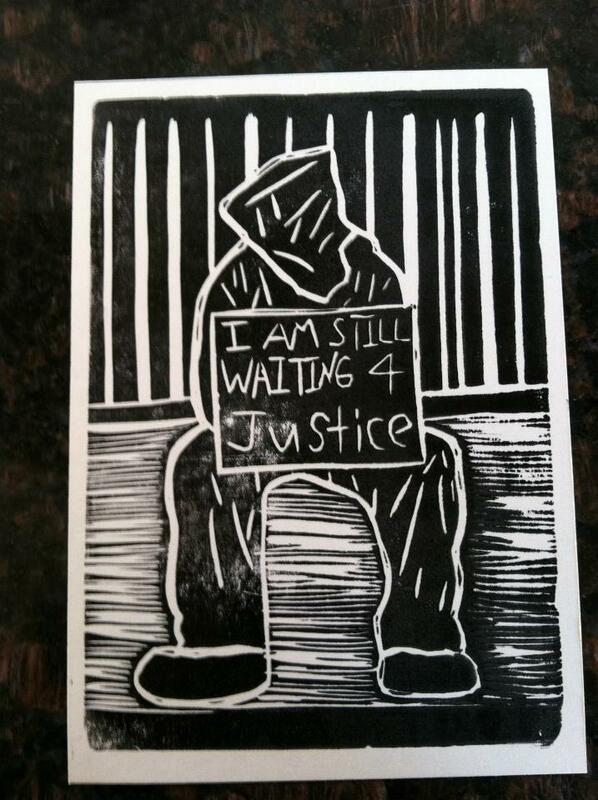 You can help publicize these events to Shut Down Guantanamo Now! by sharing this email, joining our Facebook events, and emailing us with your ideas. Guantanamo: 12 Years Too Many! 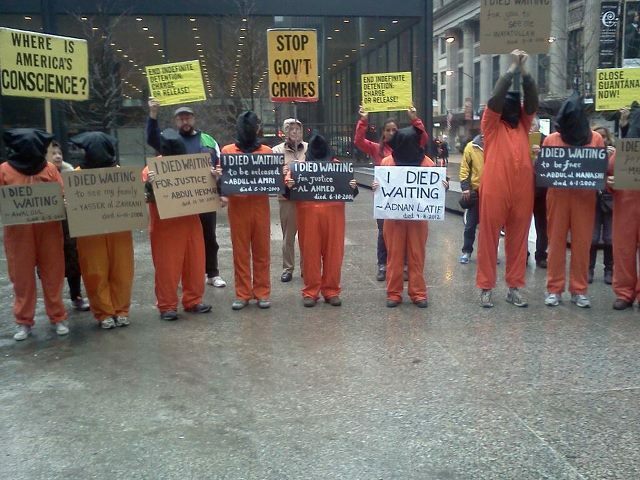 We will gather at the Federal Courthouse in Chicago (Dearborn and Jackson) on the 12th Anniversary of the opening of Guantanamo Bay prison to demand an end to indefinite detention and the closure of this torture camp. Chicago Overpass Light Brigade will join us with bright letters spelling out “Close Gitmo,” loud and clear! 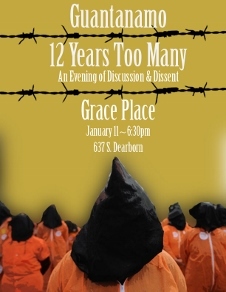 We invite you to wear an orange jumpsuit and black hood (provided) and hold a sign to protest “12 years too many!” We will read the names of the 164 men detained indefinitely in Guantanamo. If you are on Facebook, please “join” our event there, and invite friends. Our witness is more powerful when you join us ! An Evening to Discuss and Dissent! Dr. Antonio Martinez from the Institute for Survivors of Torture and Human Rights Abuses and a co-founder of the Marjorie Kovler Center here in Chicago. If you are on Facebook, please “join” this event there, and invite friends. They are artists of insults and humiliation. Where is the world to save us from torture? Where is the world to save us from the fire and sadness? Where is the world to save the hunger strikers? With expert testimony from UK journalist Andy Worthington and challenging analysis from Debra Sweet, director of World Can’t Wait, the tour will begin in New York City and go to Washington DC to join in protests at the White House demanding the immediate closure of Guantanamo. From there it will go on to the San Francisco Bay Area and southern California. The tour will hit key college campuses, reaching law students and a whole generation of young people who have never heard the stories of the Guantanamo prisoners.